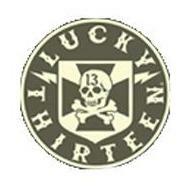 Small Embroidered Twill Patch Lucky 13 with iron on backing. Perfect for shirts, jackets, pants, bags, hats or anything else. Death Shield logo.